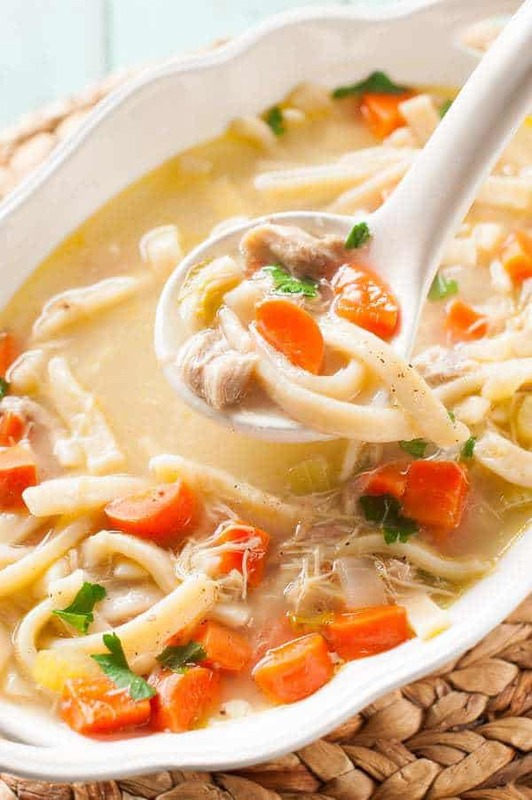 I like to cook the chicken in a crockpot using bone-in chicken thighs, as it makes the best chicken noodle soup….the bones add a lot more flavor and the chicken always ends up so tender. It takes more effort than some other recipes but it is worth it! It is the homemade noodles that take a little bit of time! Having homemade noodles is always more delicious by far than canned chicken noodle soup. There is no comparison. I absolutely love homemade noodles! My children love to help knead the dough, roll it out and roll it through the pastry maker. For years I did it without a pastry maker, and it is possible, but it also takes a lot longer and the noodles aren’t nearly as consistent. I guess you can call it “rustic” style chicken noodle soup with chicken thighs. But part of the reason this recipe isn’t that bad to make is that you simmer the main part of the soup all day in the crockpot and just at the end you make the noodles and throw them in, so it helps spread the work out over the day. I like to make this recipe for company and family gatherings because it’s inexpensive, everyone loves it and I usually don’t mind taking a little more time than usual for company. Sadly enough, a lot of people have never had clean chicken noodle soup. I’ve also been known to make this on lazy Saturday afternoons when we’re snowed in or all stuck inside with a head cold. It’s a very comforting and full of nutrients. Winters can be a very hard time for me. I love living in Utah but the one thing I have the hardest time with is the cold weather! Every year I am always trying to find ways to bear through the winter with as little suffering as possible. One of my favorite things is to eat and drink hot things. I love hot cocoa and soup! What do you do when you are cold to make it more bearable? I would love to hear any suggestions you might have! 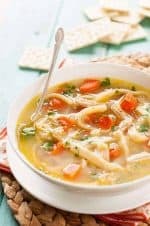 I love this crock pot chicken noodle soup recipe because the chicken cooks all day and gets really tender and then I make simple noodles. It’s so comforting and healthy and everyone loves it. Place the chicken thighs in a crock pot and cover with 6 C. of water. Cook on high for 4-6 hours or until fall off the bone tender. Turn the heat off and move chicken thighs to a bowl to cool. When cool enough to touch, remove the bones from the chicken and slightly shred. Keep warm along with the chicken broth in the crock pot. Heat the oil in a stock pot. Add the onion, celery, and carrot and sauté on medium/high heat for 10 minutes, stirring occasionally. Add the garlic and oregano and sauté for 30 seconds. Pour the chicken broth in the crock pot through a strainer and pour into the stock pot. Add another 2 C. of chicken broth to the pot, add the bay leaves, and bring everything to a boil. Reduce to a simmer and let cook for 20 minutes, or until vegetables are tender. Add the uncooked noodles to the soup and cook for another 4-5 minutes, or until noodles are fully cooked(they should rise to the top when done). Add more chicken broth, if needed. Add the chicken to the soup and add salt and pepper to taste. Turn off the heat, remove the bay leaves, and stir in the fresh parsely. What do you think about my clean chicken soup recipe? This recipe jumped right at me when I was looking for something warm to eat on a cold winter day. Thank you very much. It just made my family’s day. Ps.i made a few changes to suit my palate. Could you tell me if this soup freezes well? I’m looking for a chicken noodle soup that freezes well as there is only two of us in the house. This sounds like a fantastic recipe and I’d love to try it. The noodles won’t freeze well so make it up until the noodles part and freeze it. Then when you are ready to eat it, make the noodles and add them. Otherwise, the texture of the noodles will be off from freezing. Your soup looks and sounds delicious. I wish I had a bowl for lunch today! I have pinned this one Rebecca. A great chicken noodle soup is the best in winter so I will have to save it till then. We are in a heat wave here and on the salad wagon. Chicken noodle soup is one of my favorites, but I have never tried to make homemade noodles. I’m gonna save your recipe and try it soon. Sounds delicious! Chicken Noodle Soup has always been one of my favorites. I have never tried homemade noodles tho – will have to try your recipe and see how it comes out. it looks wonderful! I love a good hearty bowl of soup! This looks delicious! Can’t wait to try your chicken noodle soup recipe. We haven’t been sick in a long time. But, you don’t need to be to enjoy a good soup. Pinning for later thanks! This looks so good! Do you have the measurements and times? Thanks! Just made these noodles but the dough was completely runny and I had to add a lot more flour. Is this because I used wholewheat spelt flour? Next time, should I leave out the water completely? Whole wheat flour doesn’t soak up nearly as much water so I would use a lot less water with whole wheat flour next time. I always use the whitei spelt flour cause it’s a lot easier to work with and it’s not “enriched” like regular white flour. I love homemade chicken noodle soup. It taste so much fresher! I love it but very hard to make or at least for me. I know it’s a lot of hard work. I made this yesterday and it is worth the time, it turned out very good. I really love this recipe idea. I love to eat chicken noodle soup. I really like the idea of making everything from scratch. I received a pasta maker attachment for my Kitchenaid Mixer for Christmas and have really wanted to make some pasta, so your recipe will really help me out. Thanks so much for sharing! You’re welcome! It’s a little extra work but totally worth it! This looks like it would be really good. I’ll have to give this recipe a try. Thank you so much! This is great, could you add a pic of the soup and also is the last part of the instruction left over from something else? OK. I finally added some pictures of the soup. All the instructions are for the soup. Sometimes I just write recipes in order of how you do it instead of listing all the ingredients first. It works for my brain better. It’s really good. Just don’t put too much in. You can always put more in, but you can’t take it out. This looks delicious and easy to make ;thanks for post. They say Chicken Soup is good for your soul, as well as making you feel better when your sick. 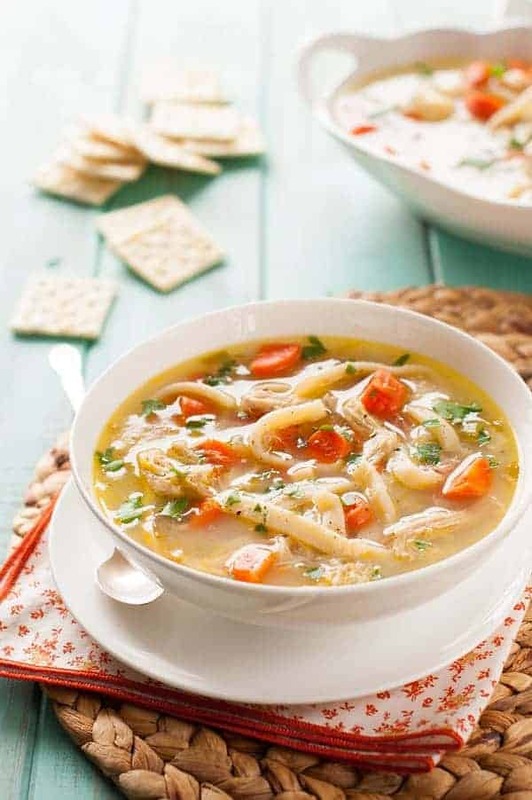 i really like this recipe because you have fresh noodles to go with this soup recipe.. I am going to try this one because I do not have a pasta machine but this does not call to use it. I hope this is as good as I think it will be!